Amazon listed new Delux Equestria Girls fashion dolls! They are $21.99 for one doll but each of them comes with 2 full outfits including a 2-sided dress. Glitzy and glamorous, Rarity has a flair for fashion and the best style sense at Canterlot High. She loves straight-off-the-runway styles, designing her own look, and anything shiny - like diamonds! Inspired by entertainment, this So Many Styles Rarity doll comes with 2 complete outfits and fashion accessories, including a 2-sided dress with Cutie Mark-inspired designs, a sheer and glittery skirt, and fabulous shrug to switch up her style more. Mix and match to make over 20 looks! Pretend she’s showing off her styles in the high school halls or generously sharing her style savvy. Pinkie Pie knows how to throw an epic celebration and bring laughter to all, because she's optimistic and loves sweets. Her friends rely on her to bring the fun, and she’s always dressed equally as festive! 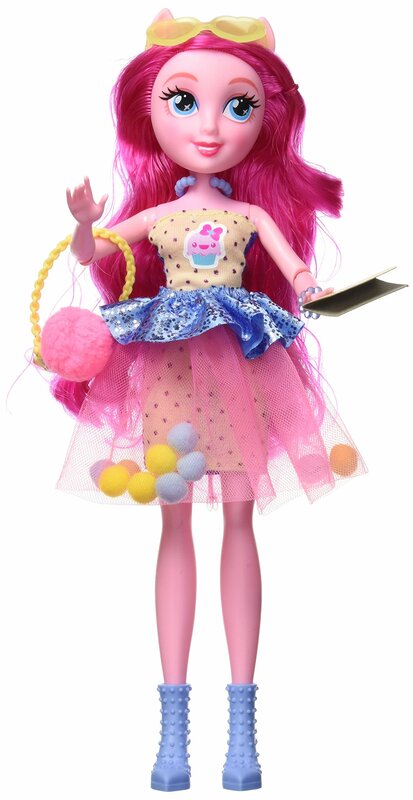 Inspired by entertainment, this So Many Styles Pinkie Pie doll comes with 2 complete outfits and fashion accessories, including a 2-sided dress to switch up her style more, a sparkly blue ruffle she can style as a shrug, shirt frill, or dress accent, and an adorably playful pom-pom filled skirt for bringing the party. Mix and match to make over 20 looks! Pretend she’s so stylish as she leads the planning committee toward another successful party. Twilight Sparkle is a magical transfer student from Crystal Prep who is super smart and focused on her studies. With the help of the Equestria Girls, she is learning the power of friendship -- and while she loves to learn, she can study in style too! Inspired by entertainment, this So Many Styles Twilight Sparkle doll comes with 2 complete outfits and fashion accessories, including a 2-sided top to switch up her style more, a fun tie accessory, and a Cutie Mark-printed sheer skirt for extra flair. Mix and match to make over 20 looks! Pretend she’s showing off her styles as she runs to science class or spends time with her friends after school.